Lovelies we are in the heart of summer and there is nothing we enjoy more than summer parties and get togethers. 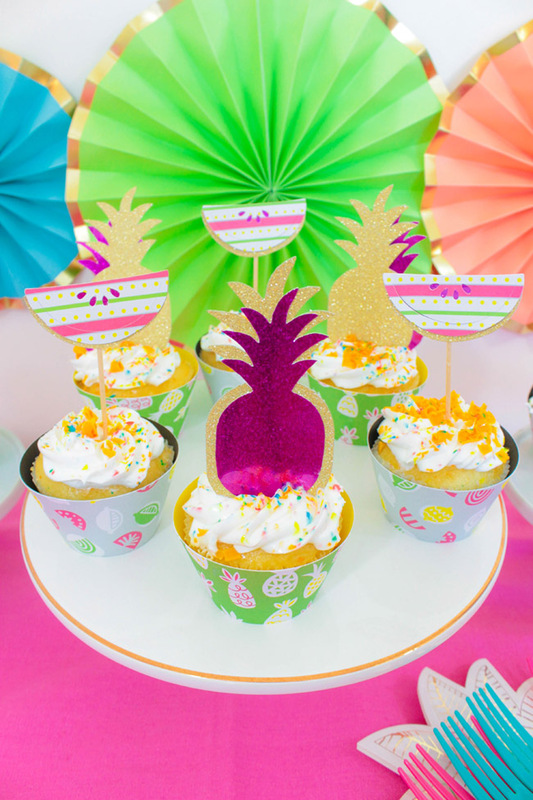 We are thrilled to show you a fun project to liven up your summer party with cute and colorful summer party cupcakes! 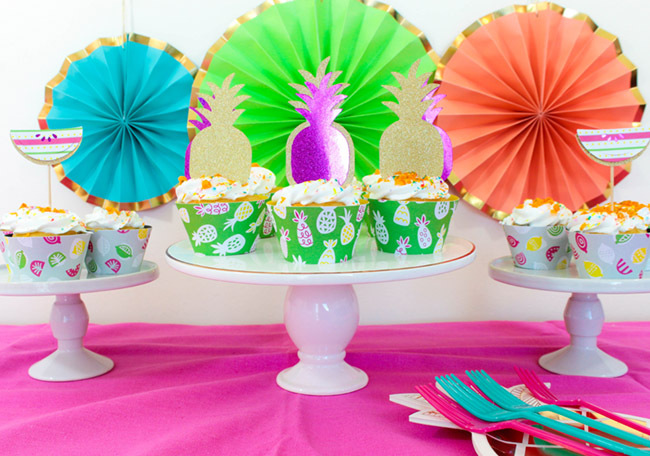 There is nothing hotter than pineapples and watermelons this summer for summer party themes. 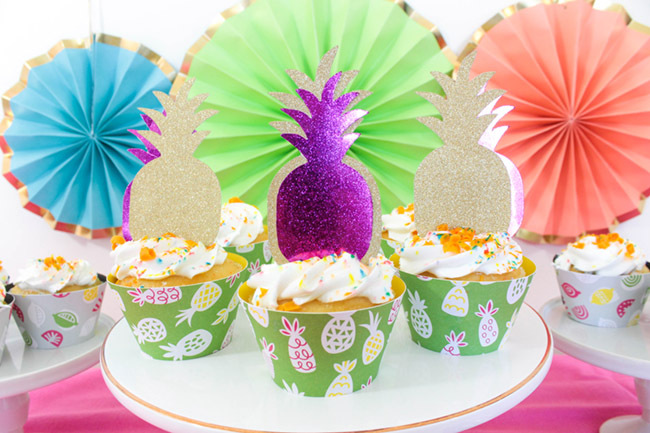 Today, we have a fun watermelon and pineapple cupcake project that you can do with you Cricut Explore Air 2 and the new Summertime Cricut papers! 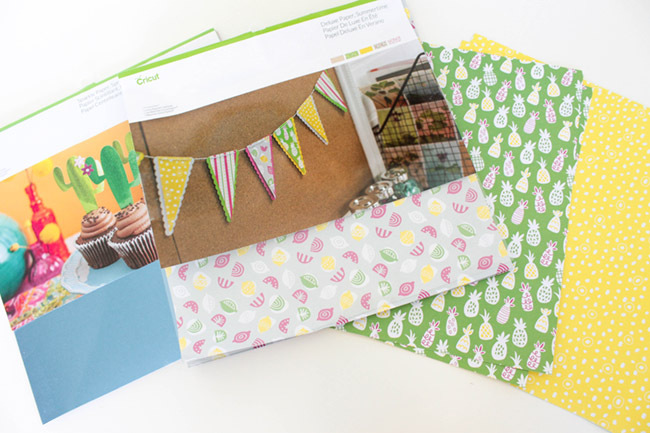 The new papers are so colorful and summery, you are going to love them at your summer parties. The best news yet is this project takes relatively little time and is super easy to do. 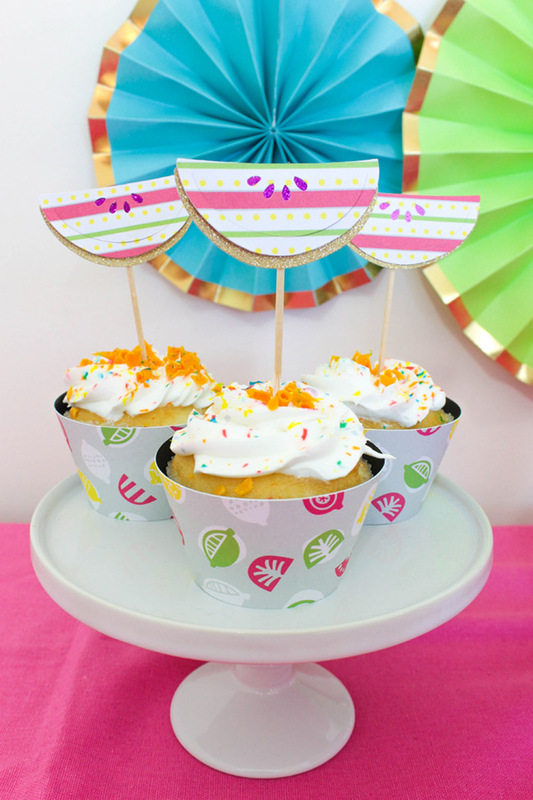 These make amazing summer party, tutti frutti party cupcakes! 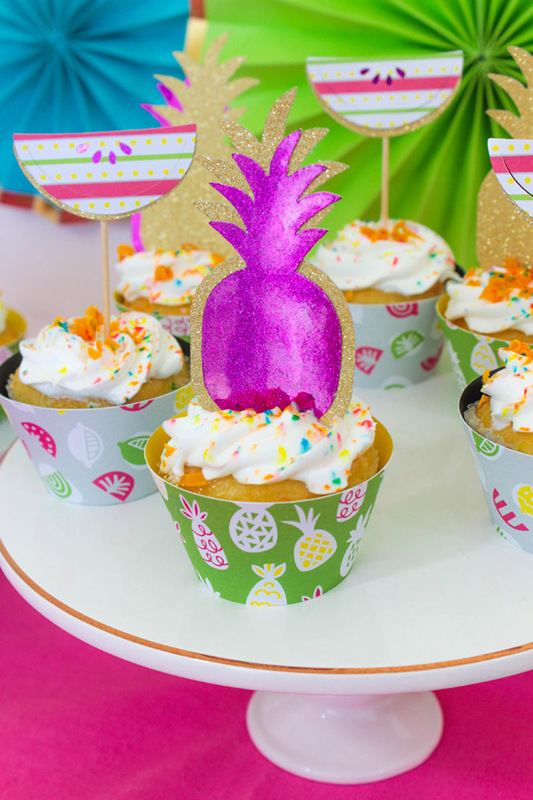 Step 1: First we are going to cut the pineapple cupcake toppers. 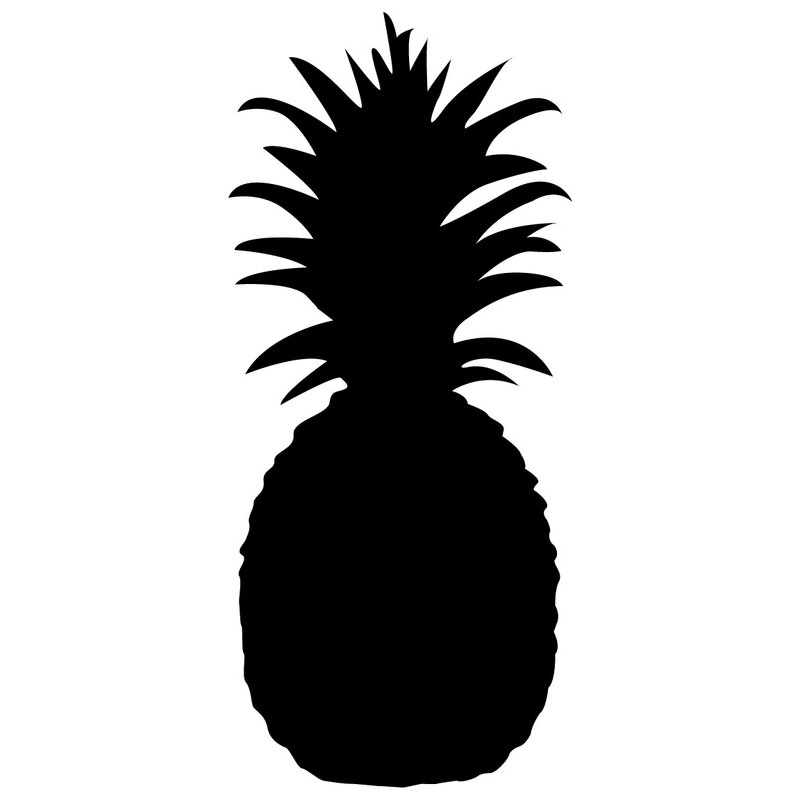 Save this pineapple silhouette image to your computer. Then upload it to the Cricut design space. Not sure how? It’s easy! 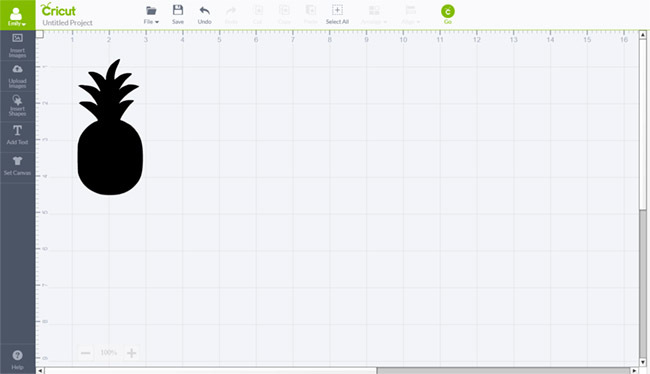 First hit create new project, then on left navigation click upload images. Under the image section, hit upload image. Select the pineapple image from your computer and upload it. After upload, select simple image. On the next screen, take the magic wand and click the white part of the image to remove it. Hit continue, then select save as a cut image. Now it’s saved to your Cricut space! Select the image and select insert images. It will now appear in your design space. 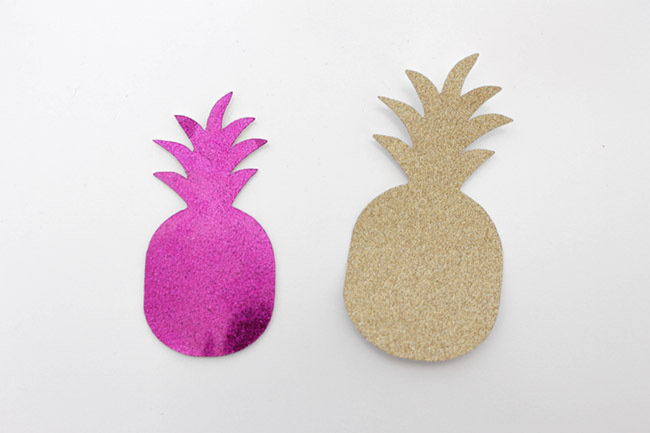 For the cupcake toppers, you will want to cut 2 different sizes of the pineapples. Size the first cut of pineapples at 2”. Make as many as you would want for your event’s cupcakes. Step 2: Take the Cricut gold sparkle paper from the set and press it to the Cricut standard mat. 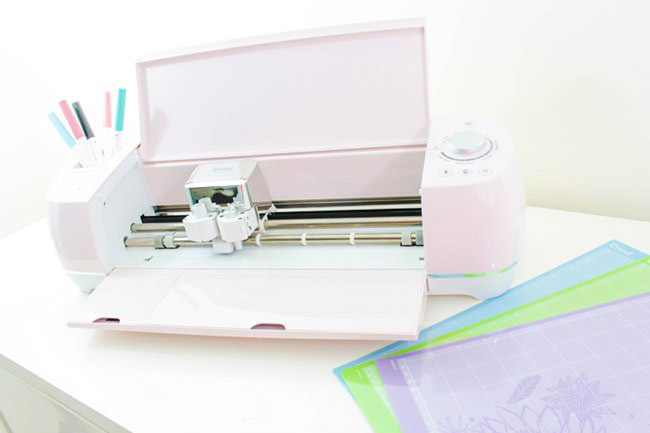 Load the mat into the Cricut machine and set the machine to Cardstock. In the design space, hit go. 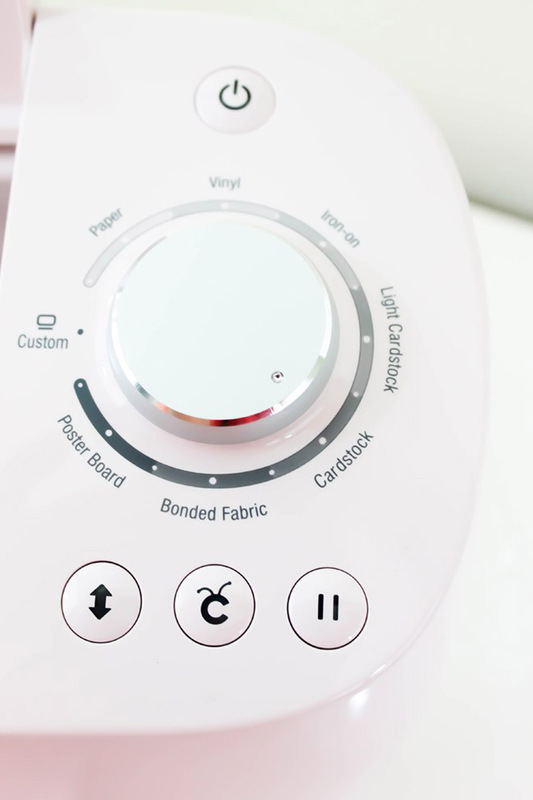 Then hit go again, select your Cricut machine and then hit the Cricut button on your machine. Watch it work its magic! Step 3: Remove the gold cut pineapples from the sheet. Remove the extra gold paper. Resize the pineapple images to 1 ½”. Grab the purple sparkle paper and add it to the standard mat. Load it again to the machine and hit go. You’ll have 2 different pineapples now, 1 gold and 1 purple. Pretty cute! Step 4: You can attach them together in any way you would like. Place the purple on top, place them behind, do whatever you like! Place the topper in the frosting on a cupcake and voila! Instant loveliness of your cupcakes. Now on to the watermelon cupcake topper! 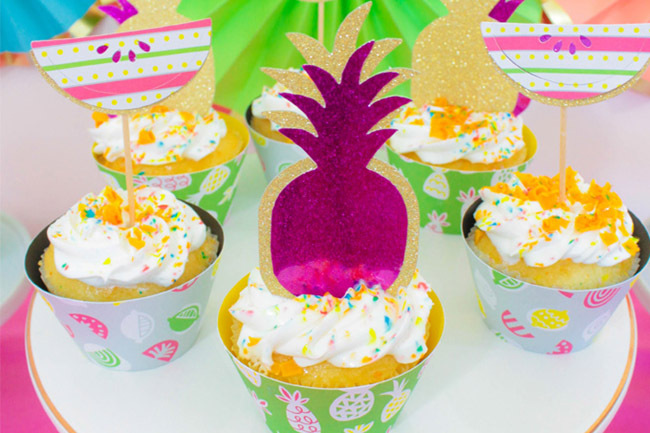 These are just as cute as the pineapple toppers and perfect for a summer party. We love watermelon in the summer. Step 1: The Cricut design space has some lovely watermelon designs to choose from. We purchased this one below but feel free to select your favorite. This image is actually 3 images and when you go to cut it, it will prompt you to cut different pages. Pretty neat! Size the watermelon to 2” and then get ready to cut. For the rind, use the gold glitter paper. Then the melon part, the striped summer paper. You won’t cut the seeds for this topper. Step 2: You will actually use a paper backing to make the seeds appear for the watermelon. 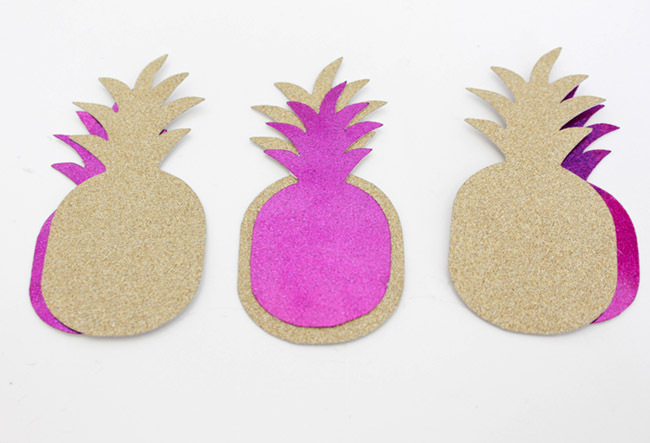 I used the purple sparkle Cricut paper which was also used on the pineapples. It makes them coordinate so well. 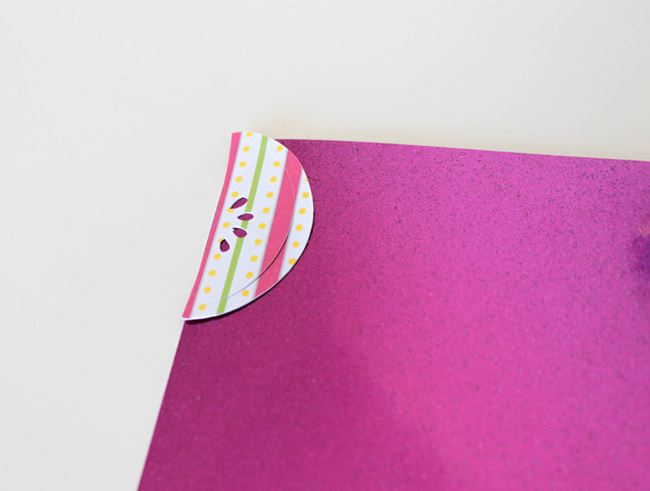 Use the watermelon piece as a template on the sparkle paper and cut around it. Step 3: You now have 3 pieces cut out for your watermelon! 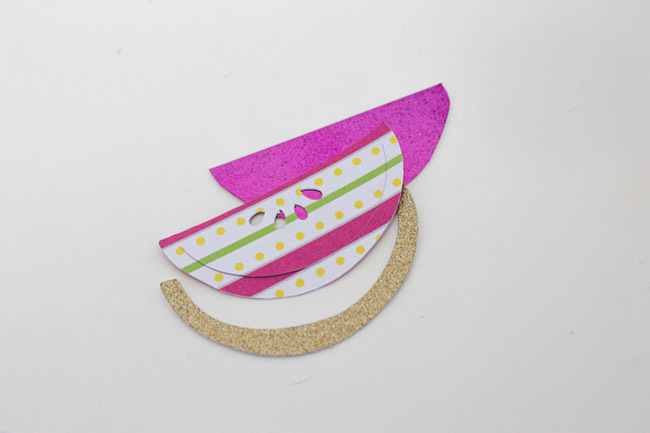 Glue the gold sparkle rind to the bottom of the striped melon part with a glue stick or glue gun. Then attach the melon piece to the purple sparkle paper. 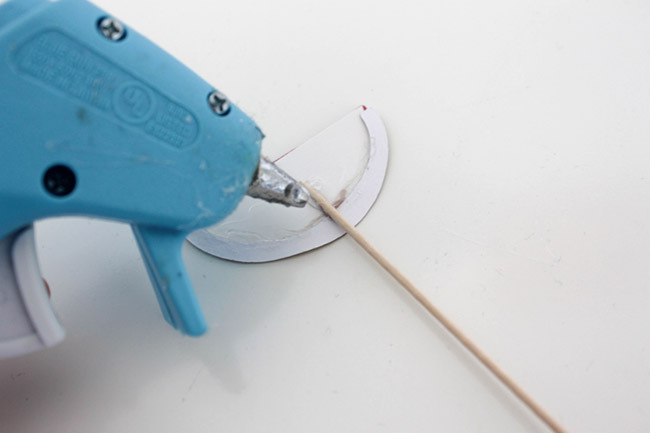 With all 3 pieces together, take a toothpick and hot glue it to the back of it. Once dried, you now have a cut little sparkly watermelon cupcake topper that you can use! Just stick into the top of a cupcake and enjoy! Now for the Cupcake Wrappers! 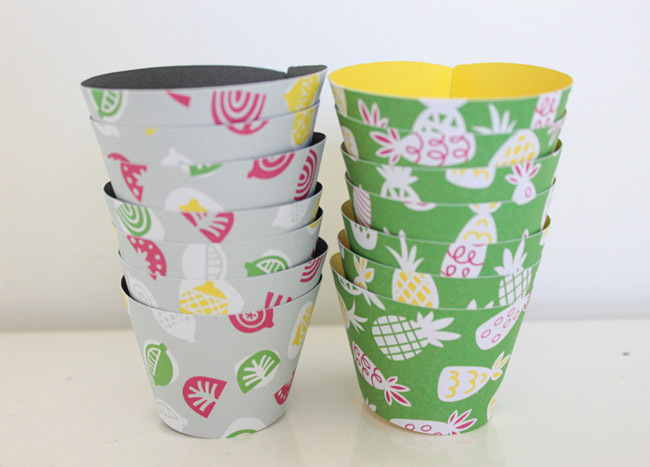 We love the fun and colorful lemons, limes and pineapple paper that comes in their summer set. They are absolutely perfect for cupcake wrappers and bring that cherry summer-time feel to cupcakes. Step 1: The Cricut design space has some wonderful cupcake wrapper templates to choose from. There are some will scallop edges, some with straight edges, or just really fun designed edges and overall looks in general. Pick which one speaks to you most! Step 2: We picked a straight edge cupcake wrapper template. Size your wrapper to at least 2” tall and 8” wide to fit a standard cupcake. Duplicate the image 6 times to get 6 cupcake wrappers per 12”X 12” page. Step 3: Place the grey lemon and lime paper to your standard mat. Load into the machine. When you hit go in the design pace, on the preview screen align the wrappers so they all fit on 1 page. Once that is set, hit go again, choose cardstock setting on the machine and then hit the blinking Cricut button to start. Watch the magic happen again! Repeat this with the green pineapple summer paper as well. 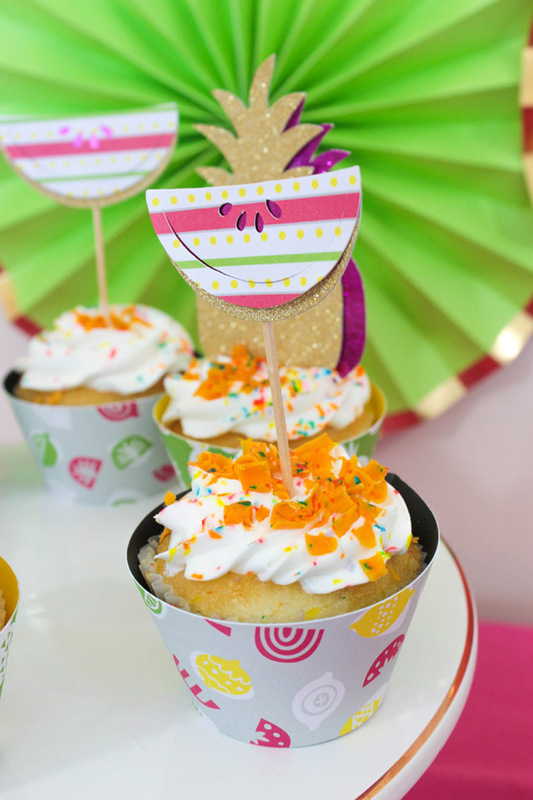 We just love the colors and designs on these cupcake wrappers. SO fun! 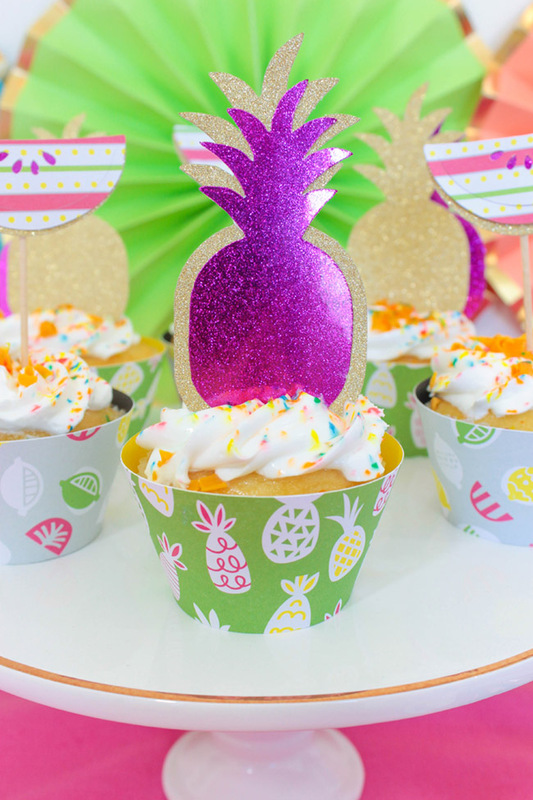 And just like that, you have custom cupcake wrappers and cupcake toppers to really deck out your summer party cupcakes. I love how easy it is to use the Cricut and how much time it saves you. Each of these took 4 steps or less and really add that extra detail to your party look that people won’t stop talking about! When you put them all together, it turns a summer party into a colorful tutti fruit one! Happy Crafting Lovelies! Enjoy your summer parties!